When Blake Biederstedt began college, he knew the job market was going to be competitive and a good engineering education would give him a leading edge. The Steinman Scholarship is awarded annually to one (1) current undergraduate entering the junior year in a four-year ABET-accredited engineering program. The award is for $5000. A 500-word (maximum) essay on "The Importance of Ethics in the Practice of Engineering;"
Official transcript from the current academic program. 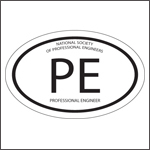 An NSPE Education Foundation Steinman Scholarship winner will forfeit receipt of the scholarship award if the recipient does not complete the year as agreed.